Can be attached to any machine in shearing/ press/ fabrication shop. Effectively separates oil-struck or heavily piled up sheets. Can be directly mounted vertically or installed with the L-shaped attachment. 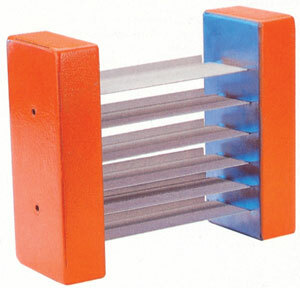 Separates stacked steel sheet for easy pick-up (one by one) from top. Most suitable for installation in narrow spaces because it is thin and compact. It is necessary to allow the floater to project above the sheet stack; this projection should be at least as great as the magnet width. Thickness and dimension of the sheet. The number of floaters required depends on whether the removal is mechanical or manual.